I just finished this book and I started it late last night. O.M.G! It was A.M.A.Z.I.N.G! 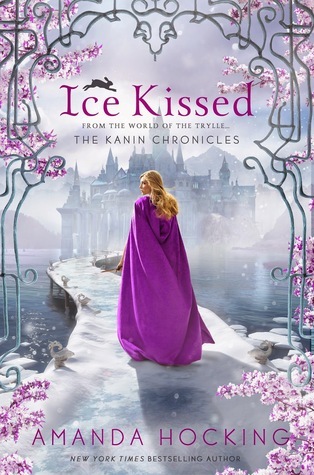 Ice Kissed is definitely way better than the first book Frostfire which is a pretty big deal if you ask me considering I found the first book really good too. Amanda Hocking's writing is an absolute beauty. I love her to death. The Trylle series made me the bookworm I am now and I thank Amanda Hocking for writing such beautiful stories like this one. "It was over, the way it should've been a long time ago, and the only thing I could do was push past it and hope that eventually the pain would get more bearable." Other than Bryn and Ridley's 'relationship', I really found Tilda and Kasper's love for each other really sweet. Their characters were so strong and I really felt like they were important. This book wouldn't be as good without them. They bring something in the story that readers would definitely enjoy. Ice Kissed and even Frostfire were both fast paced and at the end of each chapter you always want to keep reading, that's how good it is. It's also very mysterious, I was dying to know who was the bad guy. There are so many suspects that in the end you don't know who to trust anymore. I totally recommend readers who love paranormal romance to start reading this series if you haven't already. I also recommend Amanda Hocking's other series such as the Watersong Series and the Trylle Series. Her writing style is amazing, fast paced, entertaining and so on.